The Founding Fathers understood government forms. What they meant by the term was the arrangement of power found in any civil society, whether monarchy, aristocracy, or democracy. This is what Thomas Jefferson meant when he wrote in the Declaration, “That whenever any Form of Government becomes destructive of these ends, it is the Right of the People to alter or to abolish it,” and “mankind are more disposed to suffer, while evils are sufferable, than to right themselves by abolishing the forms to which they are accustomed.” The careful, prudent balancing of the forms of government in the U.S. Constitution—combining the energy of monarchy, the wisdom of aristocracy, and the accountability of democracy—is what effected the “Safety and Happiness” promised in the Declaration and made possible by winning the Revolution itself. So important is knowing our form of government for the flourishing of this republic that the Founding Fathers (Jefferson especially) considered a thorough study of history and civics in schools as indispensable for preserving our lives, our liberties, and indeed our happiness. The new national educational regime called the Common Core does not intend for students to study those forms of government. 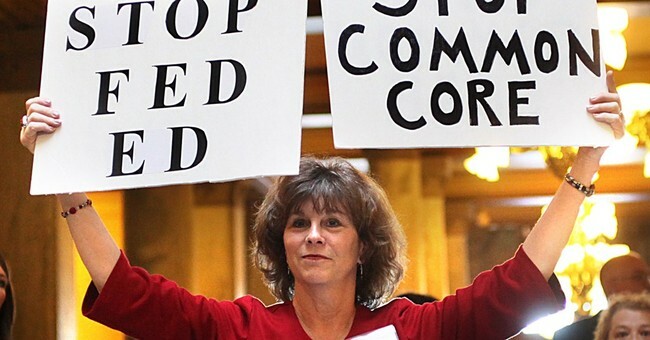 In the middle school, the Common Core calls upon students to read only the First Amendment. Apparently the other Amendments that constitute the Bill of Rights, say the Second Amendment or the Tenth, would be too taxing for fourteen-year-old minds, even though the laws of many states require students of that age to study in every detail their own sexual constitutions. Nor do even high school students get the green light to study the whole Constitution, but at this point only the Bill of Rights. Now, admittedly, the eagerly awaited Common Core Standards for “social studies” may have students learn more about their government. But why then does the Common Core have students in English class read modern commentaries on the Constitution that employ phrases such as “master class,” “ugly,” and “vicious” unless to undermine the Constitution without bothering to read and understand it? 1.Before going over the Virginia Department of Historical Resources form, discuss with students their own experiences with government forms. One common experience may be a learner’s permit or driver’s license application. Ask: What kinds of information are typically sought by government forms? Why do you think governments require this information? Possible response: Based on their experience with application forms, students may mention name, address, phone number, age, and other contact and identifying information. In the case of licensing, for example, a government that grants an individual permission to drive needs to be able to identify and contact that person. The form itself, while not interesting, is nonetheless revealing. Under the heading “cultural affiliation” (for a tract of land to be excavated), the applicant is asked to choose from “African-American,” “Euro-American,” “Indeterminate,” “Native American,” and “Other.” The editors provide coaching on how to cozy up to such questions on this or any other form: “Checklists provide an efficient way to gather important information.” Notice that the term “cultural affiliation” has replaced the more transparent “race” or “ethnic origin.” Can a tract of land affiliate with a culture? In personal terms, aren’t we all, culturally speaking, simply Americans? We could ask numerous questions of this exercise, scripted by the ever-intrusive editors of Pearson/Prentice Hall’s LITERATURE, The American Experience, volume one, Common Core Edition, page 561. Why are students in a literature class messing around with government forms? What could be read during the time wasted on this exercise? (Poe, Melville, Twain anyone?) Is the Virginia Department of Historical Resources form one of these high-quality “informational texts” promised by the Common Core that are supposed to train our children in “critical thinking” for the “twenty-first-century global economy” that we hear so much about and no one bothers to explain? Yet the most salient question seems to be, what kind of human being, what kind of American citizen, are the architects of the Common Core trying to produce? Is this an example of “critical thinking” or of uncritical acceptance of unrelenting boredom in the American classroom and unthinking compliance in our political lives? I wish I could say that this is the most egregious example of the superficiality, the absurdity, and the clear political bias that pervade the testing and curricular regime called the Common Core. Alas, not even close. There are scores, probably hundreds, of other instances of silliness and indoctrination that plague the high school curriculum alone. It is vital that parents learn what is already going on in the nation’s classrooms and how much worse things will get under the Common Core. What is more, we must as parents and citizens learn to break the code of the progressive educational establishment—which holds too many politicians and regular folk spellbound. To that end, I have written a book, drawing on my experience as a genuine school reformer, that is a thorough exposé of the Common Core. The book is called The Story-Killers. The title derives from the conviction that the authors of the Common Core are doing a lot more than dumbing down our schools. They are trying to rub out the great stories of a great people: the literature that we used to love, learn from, and be inspired by, as well as the Great American Story of human beings living in freedom and pursuing happiness under the rule of law. There has never been a great people without great stories. And we are losing ours right now in classrooms across this land. By the way, there is one other form of government we should know about and avoid like the plague. It is called progressive bureaucracy. And it has lots of forms to fill out.